CJ Logistics sets out to expand their logistics business in the US by acquiring a US logistics company. Their strategy is to become a top-tier logistics company in North America by entering the mainstream market of the US to create synergy and transfer the advanced logistics business competency. 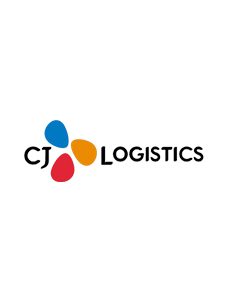 CJ Logistics (CEO Park Geun-tae) announced on June 8 that they are acquiring US-based logistics company DSC Logistics. 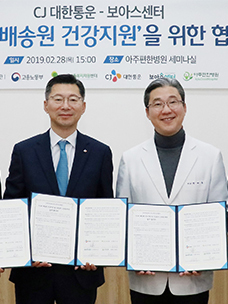 Founded in Illinois in 1960, DSC is a logistics company specialized in food and consumer packaged goods (CPG), with 3,420 employees and sales performance of KRW 578.4 billion last year. They are operating over 50 logistics centers all over the US, and their storage capacity is approximately 2.1 million m2, which is 300 times the size of a soccer field. DSC provides services such as storage, cargo handling and delivery as well as long-distance transport service to many Fortune 500 Companies such as major multinational food and consumer materials manufacturers, pharmaceutical companies and retailers. The company also has its own logistics consulting competency and IT development know-how, and offers stabilized services and high reliability proven by the fact that more than half of their major clients are long-term clients who have been with them for more than ten years. In particular, DSC’s differentiated logistics competency is officially approved with the certification of food logistics centers by American Institute of Baking and American National Standards Institute, and Verified-Accredited Wholesale Distributors (VAWD) accreditation of medicine and medical devices by the National Association of Boards of Pharmacy. Last year, DSC was also acknowledged for its excellent and competent service by being selected as one of ‘2017 Top 100 3PL & Cold Storage Providers’ by authoritative US media Food Logistics and ‘2017 Top 100 3PL’ by Inbound Logistics. CJ Logistics plans to expand the major logistics market in the US by acquiring DSC. There is intense competition among large multinational logistics companies in the US market, but not many of them have such excellent market power in the field of W&D (warehouse & distribution) which is the strength of DSC. CJ Logistics expects to rank among top-tier companies in W&D by combining DSC’s regional and industrial strengths with CJ Logistics’s W&D operation, consulting competency and global-level advanced logistics solutions. There are also expectations for synergy that will be created with the current local business efforts. CJ Logistics is already running a total of 30 logistics bases and 15 centers in 4 countries of South and North America, such as US, Canada, Mexico and Brazil. 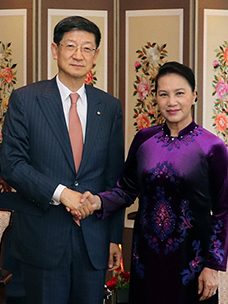 The company will be able to use its own global network to expand the service scope of DSC’s current clients overseas, while also providing broader and more diverse services by developing new services such as cross-border transport or complex transport service to neighboring countries. CJ Logistics has actively implemented global growth strategies since 2013 such as M&A of logistics companies worldwide including China, Southeast Asia, India and Central Asia, with the goal of becoming one of the global top 5 logistics companies. Recently, the company has also launched Eurasia Bridge Service (EABS) which is an international complex transport service using railway and trucks between Europe and China, and is also accelerating the promotion of logistics toward the north by opening a large logistics center the size of 14 soccer fields in Shenyang, the biggest city among the three northeastern provinces of China.